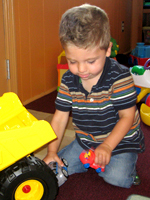 Small Wonders Learning Center is conveniently located on Nott Street in Wethersfield CT, midway between Rt 15 and Rt 99, and close to I-91 for a quick drive into Hartford. From Wethersfield, we are located at 358 Nott Street between Wolcott Hill Road and Folly Brook Road, across from Barstow Drive. From Newington, take Rt 15 to Nott Street. Continue on Nott Street for about 1 mile. We are located at 358 Nott Street, on the left side of the road across from Barstow Drive. From Rocky Hill, take Rt 99 to Nott Street. Continue on Nott Street for about 1 mile. We are location at 358 Nott Street, on the right side of the road across from Barstow Drive.